Last summer, Polly and Wolfgang decided it was time for them to downsize. They sold their roomy old farmhouse in Warren, and moved to a 6-room cottage in Waldoboro. The new house had no place to keep the many paintings they had accumulated, so they looked for a gallery space. No. 9 Friendship Road became available, and they set up shop. McGrory and Wolf specialize in American Realism style. McGrory paints in oils and watercolors, and occasionally works in pastel, Prismacolor colored pencils and various charcoal pencils. Wolf works exclusively in acrylics. No. 9 is a beautiful space in the heart of Waldoboro. High ceiling accentuated by fine cornice work, gleaming wood floor, and white walls to take advantage of natural light flooding through the front windows. 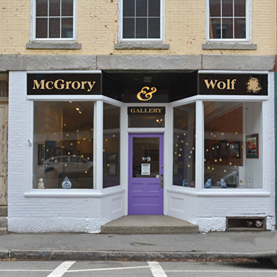 The Gallery sits in the middle of the storefront row at the crossroads in Waldoboro Center. 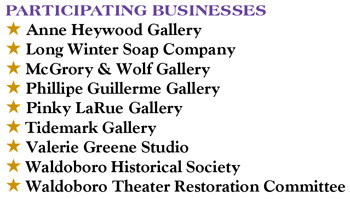 It is part of the town’s arts community, consisting of several other art galleries, the Soap Shop, the Historical Society and the Waldoboro Theater. In season, everyone participates in ArtWalk Waldoboro, every second Saturday of the month from June through October.